Every year in April, there is a herd of nearly 197,000 caribou that travel more than 400 miles to reach the plain on Alaska’s northernmost coast. This massive herd is known as the Porcupine Caribou herd and for several months of the year, this Alaskan coastal plain will be their home. It is where the females give birth every June and where the young spend the first weeks of their lives. This area is known as the Arctic National Wildlife Refuge (ANWR) and it provides vital habitat for the Porcupine herd every spring and summer as the place where they can safely birth their calves and begin to raise them (U.S. Fish and Wildlife Service, 2016). The National Wildlife Refuge System was first put into place by President Theodore Roosevelt more than a century ago (“Political History of the Arctic Refuge,” 2014). Wildlife Refuges are meant to serve the sole purpose of providing and restoring habitat for animals in the wild (Berman, 2015, para. 9). Several decades later in 1954, the National Park Service began surveying areas in Alaska that would be worth protecting under the Refuge System based upon their wildlife diversity, aesthetic values, and recreational opportunities. Almost nine million acres in the northeastern corner of Alaska were deemed valuable according to these standards and in 1960, ANWR was established. Today, this preservation area has expanded to nearly 19 million acres. The Refuge is home to a diverse collection of wildlife that includes eight types of marine mammals, 37 species of land mammals, 42 fish species, and over 200 bird species with its most notable species being caribou, polar bears, and muskoxen (U.S. Fish and Wildlife Service, 2013). The northernmost piece of the ANWR is a one and a half million acre plain that borders the coast of the Arctic Ocean. This particular part of the Refuge is referred to as the 1002 area (U.S. Geological Survey, 2016). Currently, it is not considered Wilderness because it is a vast frozen coastal plain without trees, mountains, or lakes (Energy Research, n.d.). However, this is the esteemed coastal plain that the Porcupine Caribou herd migrates to each spring and relies upon as the habitat in which more than 40,000 calves are born each year (U.S. Fish and Wildlife Service, 2016; Warden and Johnson, 2015). Unfortunately, the 1002 area in the ANWR has been being considered for oil exploration since 1980. Today, there is a strong push being made by Alaskan politicians to open up this area for oil drilling. It is estimated that this coveted coastal region holds anywhere from four to twelve billion barrels of oil (Reiss, 2017). According to the U.S. Geological Survey (2016), approximately 10.4 million barrels of this oil are actually recoverable, which translates into about one million barrels per day for the 1002 area. Based on these estimates, ANWR would be producing more oil than any other field in North America. Within the ANWR, 7.16 million acre are currently protected under the Wilderness Act and that does not include the 1002 area (Energy Research, n.d.). One of the most outspoken proponents for drilling in the ANWR is Alaska’s Republican senator, Lisa Murkowski. She is fighting hard for the rights to drill in the 1002 Area of ANWR as a means to boost the Alaskan economy (Murkowski, 2017). Murkowski argues that opening the 1002 Area to drilling would lead to a massive increase in jobs available for Alaskans and that it will mean billions of dollars of revenue for the state as well (Murkowski, 2017, para. 6). While oil drilling may benefit the state in the short term, it would only make Alaskans more dependent on fossil fuels at a time when the fossil fuel industry is becoming less and less popular (Grant, 2017, para. 3). Meaning that in the long run, the jobs created now for drilling would not last as less oil becomes used worldwide and greener technologies emerge to take its place. In addition to this, the drilling would also create a series of negative impacts to the environment that include excessive noise levels, slow ecological recovery, emissions, and sea ice danger. The negative ecological effects of oil drilling in the ANWR 1002 area far outweigh the benefits, therefore it should be declared a Wilderness area in order to protect wildlife and the environment from the impacts of drilling activities. The distinction of Wilderness gives the strictest regulations possible for public land protection. Becoming designated Wilderness would make it illegal to drill for oil in the 1002 area (Sanders, 2015, para. 3). Keeping oil rigs out of the area would prevent harm to the caribou herds and other wildlife that rely on the 1002 area for habitat because they would not have to migrate elsewhere to avoid the noise levels and pollution. The Porcupine caribou are an important part of the ecosystem of the 1002, both depending on the environment they live in as well as enriching it (PCMB.ca, 2017). Ecologically, we should care because of the negative effects oil exploration and drilling will have on the surrounding ecosystem. Noise pollution from oil fields in the 1002 area causes the Porcupine Caribou to cease migration to the coastal plains for calving season. When noises from the drilling exceed 75 decibels, many animals are unable to tolerate it and will avoid those areas (Drolet, Côté, and Christian , 2016). 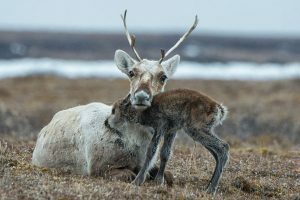 Thus, oil drilling will cause a decrease in the caribou population because it would drive them away from the calving grounds that they have relied upon for generations to raise their young in. Caribou are one of the most prominent animals in the northern Alaskan landscape. One study simulated what would happen to their populations if onshore oil rigs develop near their habitat. The study found that when subjected to the harshest development scenario of 15 rigs, all open for leasing, the caribou lost 34% of their habitat used for calving grounds when they were forced out of it by drilling the effects (Wilson et al., 2015). Excessive noise levels from the drilling activity causes these animals to migrate from their high-quality sites into areas that are less suitable for their needs (Drolet et al., 2016). According to Griffith et al. (2002), pregnant female caribou will not cross over or under oil industry infrastructure during calving season (p. 40). This creates a large problem since the females are usually pregnant when they migrate to Area 1002 every June (U.S. Fish and Wildlife Service, 2016, para. 4). This could mean that they are unable to reach the area and may not be able to properly give birth and raise healthy calves. Additionally, caribou forced to migrate from their habitat in the safe coastal plains to the mountains may likely run into many more predators, such as grizzly bears and wolves. According to Griffith et al. (2002), grizzly bears’ habitat is primarily in the mountainous foothills and there has never been a report of wolf dens on the coastal plains (p. 51). Without trees or mountains in the 1002 area, these animals are not very present on the plain, thus making it safer for the caribou to be there than further inland where those predators are more abundant. The environment in the ANWR is very sensitive to anthropogenic disturbances due to the brutal climate that allows for a short growing season for vegetation to recover from any damage. This slow ecological recovery puts the wildlife, such as the caribou previously discussed, in danger of not having enough food supply. The anthropogenic changes in the ANWR will be detrimental to the vegetation, like grasses, mosses and small shrubs. The pollution released by these oil sites causes death or illnesses that eventually lead to death to surrounding animals (Arctic National Wildlife Refuge, 2016). Therefore, the overall pollutants from oil exploration have negative impacts on both the habitat and migration of wildlife in the ANWR 1002 area. Being how remote and wild this land truly is, it is not often traveled. This is also true for Prudhoe Bay, where there is currently oil drilling occurring. According to Barringer (2006), there was a spill comprised of 267,000 gallons of crude oil across two acres along Alaska’s North Slope (para. 1). The spill took five days to detect due to it starting as pin sized hole that expanded under pressure and most of the oil seeping under the snow (Barringer, 2006, para. 3-4). Inspections of the pipe showed that the almost 40 year old pipe had increased corrosion but not enough to worry about. The leak was also too small for system to detect so nobody knew (Barringer, 2006, para. 9-10). This is not the only spill from this pipeline however, there was an 11 million gallons spill in 1989, a 700,000 gallon spill in 1978 and a 285,000 gallon spill in 2001 (para. 7). Spills happen no matter how careful the companies are. A spill like this could force the Porcupine Caribou out of even more of their habitat. Oil drilling in the ANWR would have economical value to Alaska, however in the grand scheme this value is outweighed greatly by the negative ecological impact it would have. 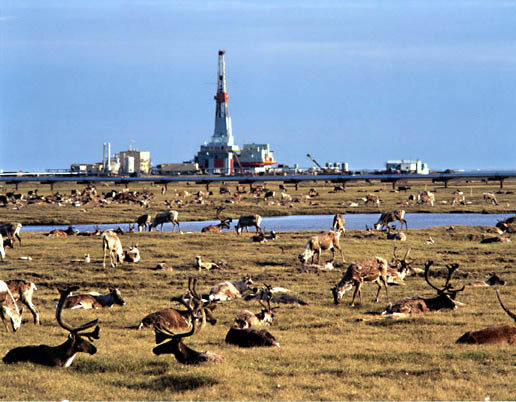 The noise from the oil rigs is too loud for the Porcupine Caribou herd to tolerate and would force them out of their environment (Drolet et al., 2016). This would also disrupt their migration patterns because a pregnant female will not cross under or over any oil infrastructure (Griffith et al., 2002, p.40). This makes the routes that they can take even more selective if not impossible. In addition the herd would have to move into the mountains, where their predators are, which would lead to fewer offspring surviving (Griffith et al., 2002). If all of this still isn’t enough the herd could end up running out of food. The Arctic has a slow ecological recovery with a very short growing season due to the nature of the climate (Arctic National Wildlife Refuge, 2016). Not only is their land being taken by the oil rigs, but also their food sources. Making the ANWR completely designated as Wilderness would make drilling illegal (National Parks, 2012, para. 6) protect this herd for years to come while also preserving the pristine piece of land that is truly left without human interference. Pcmb.ca. (2017). Porcupine Caribou Management Board. Available at: http://www.pcmb.ca. Previous Article← Replace Hydropower Dams to Save the Southern Resident Orca Whale Population!